During the 1980s, Europe became the world's biggest market for motorcycles. In order to respond more appropriately to customer needs in the key national sales areas, the task of writing the specifications for the new Yamaha models destined for Europe was entrusted to the branch office that the marque had established in Holland. The motorcycles remained 100 percent Japanese in terms of design and construction. But the choice of overall concept and styling became the responsibility of the product planning team of Yamaha Europe, consisting of former French motorcycle journalist François-Marie Dumas and English ex-Norton engineer Bob Trigg. That was how the highly original FJ 1100 was created, though not without problems. For once, it didn't follow the lead of Honda, which was then the sole standard-bearer of the V-four layout. 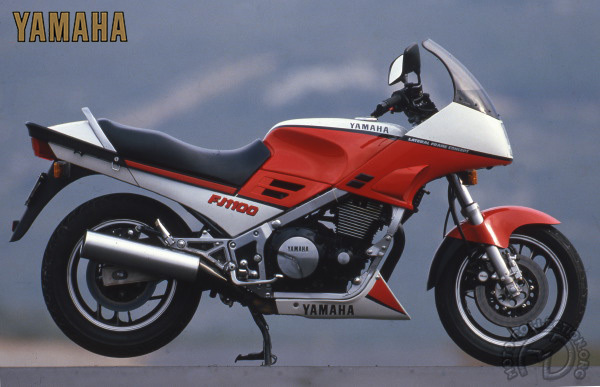 It established itself as the leading grand touring motorcycle, and its worldwide career was exceptionally long. The FJ 1100 introduced many technical novelties, in particular a very special wide frame with square-tube side members, which was destined to be widely copied. A state-of-theart sportster, the FJ had an outstanding engine allied to excellent road manners, but the secret of its success was its great homogeneity; beneath its .sporty robe beat the heart of a machine perfectly suited to the needs of lovers of fast touring machines. Riding on large-section 16 inch wheels, the Fj 1100 was a confidence-inspiring mount and quickly established itself as a leading machine.